Welcome to Agrios*Diathsi's personal page. Who's Agrios*Diathsi? Why, she's me! I'm her! Well, she is who I am at the Wild Wolf Society, which is run by Charisma*Wolf. This is a wonderful site! You can join a pack and role-play with others who love wolves too. Look for me as Agrios*Diathsi, the Alpha female of the Spirit Mountain Pack! History: Agrios had a pretty decent life as the first born of the Alphas of the Jadened River Pack. But at the age of two years, her mother disappeared and humans captured her father. The rest of the pack was in chaos and Agrios left to wander. After a couple of months she found her first mate and together they formed a pack. 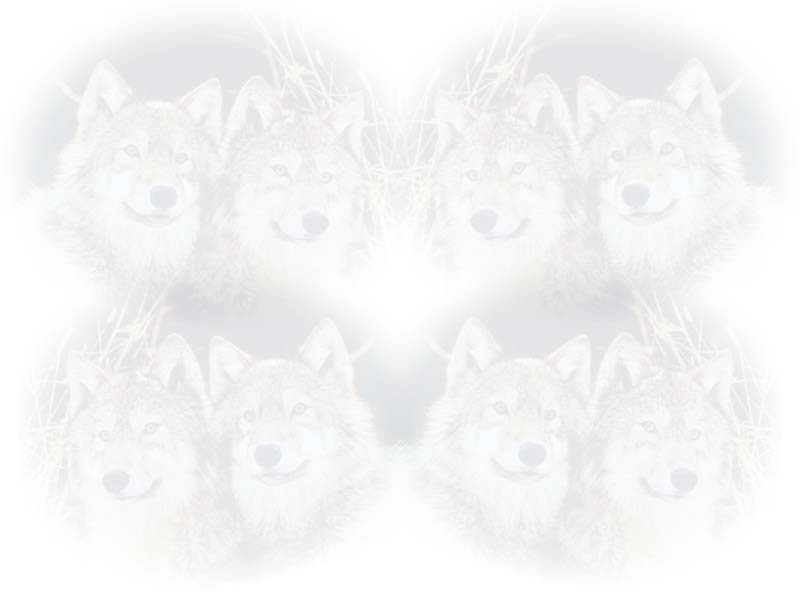 They allowed other lone wolves to join and soon the pack flourished, but because of that things became worse. With so many wolves in the pack they began to squabble with each other over little things. Agrios, being young for an Alpha, attempted to assert her authority, but became bitter and did many things she still regrets. A little later a she-wolf appeared and her mate fell in love with her, turning against Agrios. With her rank taken and all respect lost, Agrios left the shameful pack to wander some more. During the two years of roaming she had two mates, both of which disappeared without a trace. Emotionally tattered and torn, she stumbled into the Salvaje Valley. She became the Beta of the Siena Mountain pack and about a half year later gained the title of Alpha female. While living there she found another mate named Vegga. More than a year after she joined Siena Mountain, tragedy stuck the mountain and the pack was forced to break up. Her friends joined the other local packs while Spirit Mountain took Vegga and her in. Unfortunately, devastation had seemed to follow her. Spirit Mountain�s number of members dropped drastically and Vegga disappeared. But all was not lost for this worrisome wolfess, for a tide of newcomers began in the fall and her pack soon filled. Initially RPed in: A Beseen chat room three years ago. The place was taken over by Dragons, Humans, and Horses. Although, the people there before weren't to be trusted. Below is my Energy Stone table. The stones in the top row is for the stones I have/will receive for quizes. In the bottom row, the golden stone symbolizes my Alpha status and the Raspberry stone is for the poem I contributed. The Black stone is for completing level one.